California Sen. Kamala Harris has once again shown a room of old white men how to do their damn jobs. This time around she was the only senator to hold skittish Keebler Elf Jeff Sessions accountable during his astonishingly numb and condescending testimony before the Senate Intelligence Committee on Tuesday afternoon. That leaves a lot of troubling, important questions for Sessions to answer. Except that when it was time to testify, the nation’s most powerful law enforcement officer and top lawyer had about as many lame excuses as a middle schooler who forgot his homework for the 30th time. If Sessions did not reply that he “couldn’t recall” or “couldn’t remember” a conversation, then he refused to answer questions on grounds of so-called executive privilege. HARRIS: You referred to a longstanding DOJ policy. Can you tell us what policy it is you are talking about? 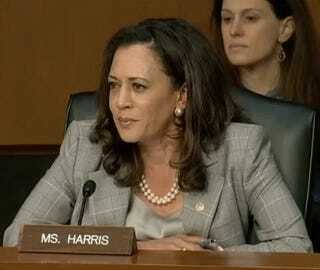 HARRIS: Sir, I’m just asking you about the DOJ policy you are referring to. SESSIONS:...because that’s a longstanding policy that goes beyond just the attorney general. HARRIS: Sir, I am not asking about the principle. I am asking when you knew that you would be asked these questions and you would rely on this policy, did you not ask your staff to show you the policy that would be the basis for you refusing to answer the majority of questions that have been asked of you? It was at this point, in her last question, when other Senators interrupted her to come to the defense of the poor old white guy with the bad memory. They did not, of course, so rudely cut off any of the men who spoke beyond their allotted time before her.